The transformation of politically important elements of cosmology—rather than the elimination of their significance—is once again central to Schaffer’s argument (see also the transformation of comets from omens to source of physical disaster). Here Priestley’s objection to the pneumatic philosophy of souls and spirits (as in Disquisitions on Matter and Spirit, 1777) brushes away the idea of mind as guided by spirit to allow the mind to be seen as a material organ with its own relationship to the material world, including its pneumatic aspects. A new hygiene is now required to ensure proper reasoning: the elimination of unhealthy air and the creation of well-aired environments by “medical managers”. Hence the importance seen in the program of eudiometry. (Incidentally, readers should also be aware of the importance of historian Roy Porter’s work to the identification of a medical enlightenment). The members of such a [model] polity were to be governed through the complete management of their atmosphere and their surroundings. The Panopticon relied on the link between the bodily situation of its inhabitants and the state of their mind. The right distribution of light, air, and space prompted the right associations: every inmate would ‘conceive himself’ to be under constant surveillance. ¶ The Panopticon was an ‘enlightened’ project, concerned with rational order and moral reform, deriving its authority from the natural philosophical understanding of the work of the mind (234). Golinski’s more directed concern with chemical experimentation highlights what kinds of experimentation were appealing or possible in different political environments. He observes the importance for Priestley of simplicity of method and instrumentation, thereby allowing experiments to be widely replicated and the rational process of discovery to be shared by experimenter and audience alike. The troubles with complexity of instrument formed part of the rhetorical arsenal against Lavoisier’s chemistry. The shared rational experience could also carry its own burdens, particularly in the wake of the purported rationalism of the French Revolution. The shared experience of breathing nitrous oxide, and the resulting delirium, could easily be attacked as being of a piece with the mad excesses of the Revolution, particularly for the experiments’ association with radical figures such as the physician Thomas Beddoes (1760-1808). Chemistry became a regular target for anti-Jacobins such as Burke. In the 1790s, Priestley’s house was destroyed and he emigrated to America. It was in these circumstances that chemical experimenter (and poet) Humphry Davy (1778-1829) severed his relationship with provincial chemical philosophy, its radical political affiliations, and its experimentation with nitrous oxide, and moved in 1800 to conservative London and the new Royal Institution (RI, est. 1799). Here Davy was able (eventually) to shed the controversies the provincial philosophers attracted. 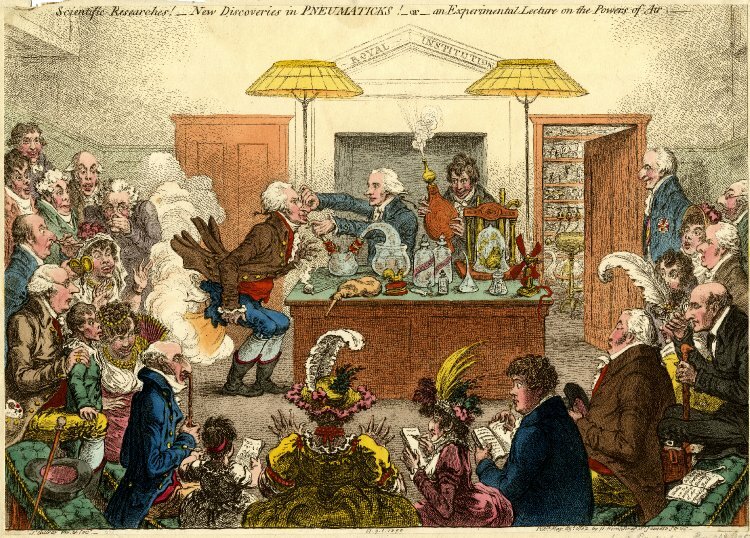 Why "eventually" is included in parentheses: an 1802 cartoon by James Gillray of a demonstration on nitrous oxide done in 1800 at the Royal Institution. Davy is holding the bellows. At the RI, Davy crafted a different relationship with the audience. For example, by commanding the sophisticated apparatus of the voltaic pile, he was able to use its “galvanic fluid” to dissociate chemicals into their basic elements. The pile was expensive, and not a common device of chemical experimentation. Its creative use secured Davy’s reputation as a scientific “genius”. In lectures, he did not come to experimental conclusions with an audience; he interpreted his carefully crafted performance for them. In this position of responsibility, to the disappointment of some, he refrained from connecting chemical work to political philosophy, and enjoyed a productive career in the metropole (see also our primer on Faraday). Davy demonstrates to a captive audience an electric light, powered by banks of voltaic piles kept in the Royal Institution's basement. As I noted in January, in a 1986 piece Schaffer understood the rise of the idea of “discovery” by inspired geniuses to split scientific work into elite figures and ordinary laborers, which augured the “end of natural philosophy” and the rise of professionalized science. In “Genius,” he elaborated that the extension of the disembodied force of “genius” from artistic masters to the work of philosophers in the late-18th century helped to dissociate their accomplishments from their political authority. Where figures such as Johann Gottlieb Fichte (1762-1814) would connect Romantic ideas to enlightenment ideals in his “attempt to connect the work of philosophical genius, natural power and popular right” (85), others called foul on the implication “that genius had been collectivized” (ibid). For figures such as Burke, genius was localized and the process of achieving new insights stood apart from any rational process. Ethics, not reason, was the only firm basis of polity. Geniuses were themselves bound by ethical responsibilities not to exercise their powers inappropriately, as was said to have happened in the Revolution. Rationally constructable principles discovered through genius could only be worked out subsequently. Once they were, they could be taught to others, and possibly—as in the late-enlightenment philosophy of Immanuel Kant (1724-1804)—become a basis for authority.